BATTLE GROUND — Voters within the borders of Battle Ground Public Schools are facing a vote on a proposed bond measure in the Feb. 13 special education. One of the components that the bond would fund is a new Alternative Learning Experience (ALE) campus on district-owned land near NE 199th Street and NE 72nd Avenue. 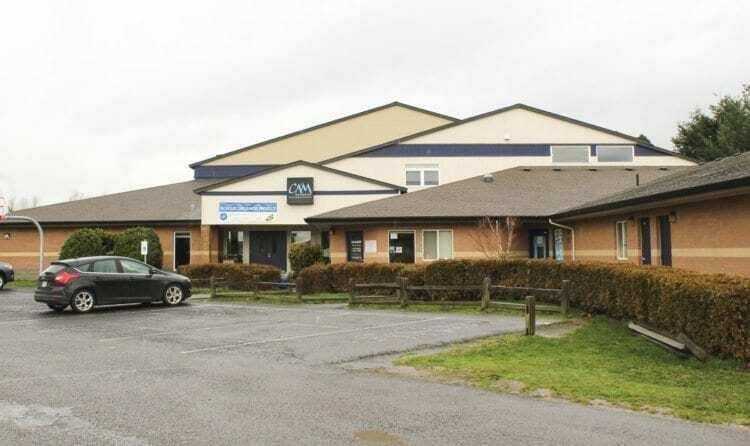 The new site would house new facilities for CAM Academy, an alternative third through 12th grade school that is currently housed in a building off of Onsdorff Boulevard in Battle Ground that the district leases. 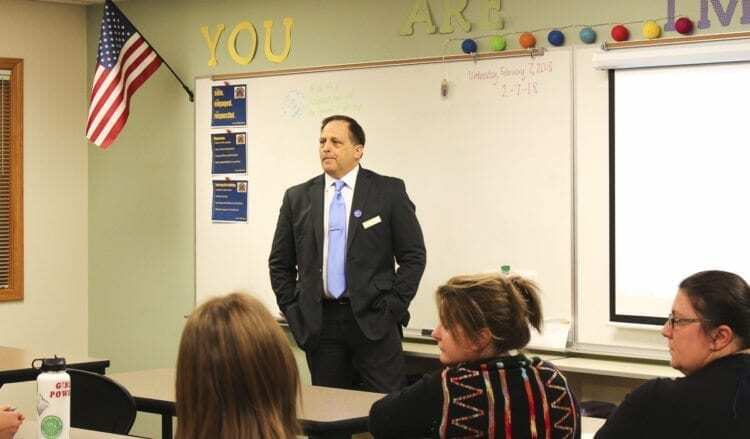 Battle Ground Public Schools held an information night at Chief Umtuch Middle School on Tuesday hosted by district Superintendent Mark Ross, during which district representatives answered parents’ questions about the proposed new CAM facilities and how they would affect the school. Ross said that the current bond proposal as formulated by the district’s Facilities Improvement Team is considered to be phase one of a three-phase bond project over a period of 18 to 20 years. According to Rita Sanders, communications manager for Battle Ground Public Schools, the district renewed its lease for the CAM building last summer, at the same time that it was examining possibilities for a bond. Sanders said that a conversation began about the future of CAM and if it was appropriate for the school to remain in a leased building. At the information meeting, Ross said that having a school in a leased building creates several disadvantages for the district. For one, because the district does not own the CAM building, the building does not qualify for state matching funds, and improvements or changes have to come directly from the bond fund itself. Additionally, housing students in a leased building means that CAM’s student population does not count towards the district’s official student population according to the state, Ross said, which creates issues when estimating enrollment and capacity figures to qualify for state matching funds. Currently, the school district is leasing the facility for approximately $500,000 per year, and Ross said that over the last 11 years, the district has spent about $5 million to lease the CAM building. Ross said that one of the main questions when discussing the new ALE site is why the school district does not simply buy the current CAM building. Several factors made this an unattractive option for the district, according to district officials. Sanders said that an initial assessed value of the building was $2.9 million, but the owner allegedly wanted to sell the property for $4.8 million. Ross said that while the district took into consideration the cost of purchasing the building, other factors were also considered. To bring the CAM building up to newer standards, the district would have to make changes upon its purchase. First, there are no bathrooms or major plumbing facilities on the second floor of the building, and these would need to be added. Secondly, Ross said that an elevator may need to be added as well. The total cost of the improvements to the CAM building would cost an estimated $2 million to $3 million, Ross said. In addition to limitations of the current building, Ross said that there are concerns about the site itself. Ross said the current location limits any sort of expansion of grade levels or services offered to students in the building. The CAM site currently owns only 12 parking spaces as well, Ross said. Most of the parking lots and the field utilized by CAM is owned by the Battle Ground Baptist Church. Ross said that the proposed location for the ALE campus offers room for expansion. The preliminary site plan, which has not been finalized and is subject to change, calls for three buildings. There would be one central commons building potentially housing a gym, cafeteria, a small library and offices, as well as potentially housing classrooms. Two modular buildings of 10 classrooms each, or ten-plexes, would also be built. Ross and the district’s director of facilities, Kevin Jolma, addressed concerns that CAM was being moved into portables. Ross said that the modular buildings are meant to be permanent. Jolma explained that modular buildings are intended to have a 30-year useful life, and are fully plumbed and wired with utilities, unlike true portables. Denny Waters, deputy superintendent for the district, said that modular buildings offer more flexibility in internal configuration than do traditional buildings. “I really consider this permanent,” Ross said regarding the status of modular structures. Waters also said that the proposed site has room to put in a playground and develop play fields. The surrounding wetlands could also be used as an outdoor area to study science and nature, he said. Several students at the meeting raised concerns from their perspective about the new location. They said that moving CAM would create difficulties in getting to and from school and to other extra-curricular activities at other schools. Bussing is currently not a consideration, Ross said, because CAM is considered a “choice school,” meaning families choose to go there and thus provide their own transportation. It therefore does not qualify for bussing options. Parents in attendance addressed concerns about a lack of bussing. Several said that they drive their kids to CAM already, and that the move would not adversely affect the number of students attending. Benjamin Howard, a student in attendance at the meeting, noted that one of the draws to CAM is that it is a small school. Ross said that while this is a benefit, moving CAM would provide opportunities to allow more students who want to participate in its program through expanded facilities. “I would like to have the option to see the amazing things that are happening at CAM available to more kids,” Ross said. Ross said that the proposed new school site would cost approximately $12 million to build. Should the bond pass, he explained the best case scenario for opening the new facility would be at the end of the current lease term at the end of 2019. According to Jolma, no plans are solidified except for the need to have the one brick and mortar commons building and two modular buildings. The actual building and site plan would need to be developed from input provided after the outcome of the bond vote. Madelaine Prather-Albers, another CAM student in attendance, expressed concerns she said were shared by her fellow classmates that moving CAM into a new facility less central in the district would affect a unique student culture that has developed at the school. Battle Ground Public Schools seek approval of a $224.9 million bond on the Feb. 13 special election. Several parents of current CAM students in attendance at the meeting expressed support for the bond measure and move as necessary for the future development of CAM. Tara Poor said that the new site allows for new growth at CAM. She also said that the move may benefit students in other parts of the district not in Battle Ground that want to attend the school. “This might provide that opportunity,” Poor said. “This would be a great move for CAM,” Poor said after the meeting. She said that while CAM was intended to be small, it is indeed growing, and the new site would not only provide new buildings but a new, larger area in which to facilitate that growth. “I do think that the opportunity to have a larger location would be key,” Poor said. Poor also said she did not understand students’ concerns about transportation. “That should be my worry as a mom,” she explained. Dana Taub, a CAM parent, said that over the long term, the move would be a benefit rather than a hindrance to CAM. Having the school in district-owned buildings will mean that the students will count on the district’s roster, she said, which currently is not the case because the facility is leased. Jesse Murray was a CAM parent in attendance at the meeting as well, and was strongly in favor of the bond. During the meeting, Murray echoed other parents’ assertions that the move would be good for the school because it offers more opportunities to grow. “This is a beautiful piece of property,” Murray said in reference to the proposed site, “and we have so much options for our kids to grow.” The new site would allow for new educational opportunities and expanded class work such as AP classes that cannot currently be easily added at the current location, Murray said. “We have the option of being able to advance CAM into the future and make it better by allowing for more courses,” Murray explained. Outside of the public meeting, Murray said that the move would be “a good opportunity for our kids.” The modular buildings he said offer greater flexibility in design and use, and more options for future expansion. “Most people want something fresh,” he said, and that a “new, fresh CAM” would be beneficial. Compared to leasing the current building, Murray said that the new district-owned site would be “very economical” and makes sense. Ross also said that there are currently no plans to move other alternative learning schools in the district, such as River Homelink and Summit View High School to the new site along with CAM Academy should the bond pass. Ballots for the bond vote must be submitted by Tue. Feb. 13 at 8 p.m.